Twitter launched some cool features last week. 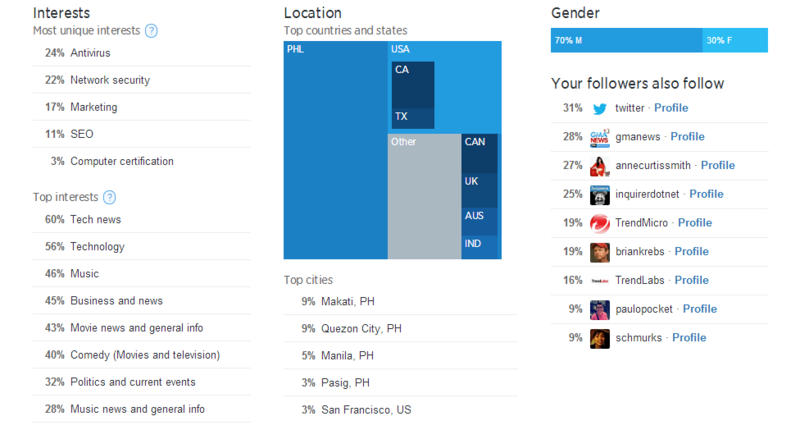 Going to analytics.twitter.com will give you great metrics about your tweets and your followers. For followers stats, it shows data about your followers interests (Top Interests and Most Unique Interests), location, gender and list tweeps your followers also follow. For the tweets metrics, it highlights your tweets impressions and engagement data. Good visualization given the data is free. For the followers stats, I believe it’s already there as you check it out, but for the tweets metrics, you need to somewhat enable it (or login once into the analytics page) to start the population of data. We might argue that these are geeky data points, but my personal take here is that in this interconnected world of social media this is good and interesting data (and quite possibly profitable too *hint* *hint*) . No security issues so far but I will try to update this post (and my soon to be re-launched tech blog) if I find something new. Next PostNext Congrats Gilas Pilipinas!! !